Express-Select digital controls Simplify oven operation. A kitchen timer and timed cook option assist you in coordinating meals. 4.6 cu. ft. capacity in the upper and lower ovens Along with 2 heavy-duty racks and 1 offset rack with 5 rack positions in each oven provides plenty of space to cook large meals for your entire family. True Convection system Utilizes a 2500W convection element and a fan to efficiently circulate hot air throughout the ovens, allowing fast and even convection baking, broiling and roasting. Effortless convection conversion Takes the guesswork out of convection cooking by automatically adjusting standard baking temperatures to convection temperatures. 6-pass, 3400W Power Broil element With a variable temperature setting from 400° to 550°, along with a 2000W hidden bake element, accommodates a variety of recipes. Even Baking technology ensures consistent baking results. 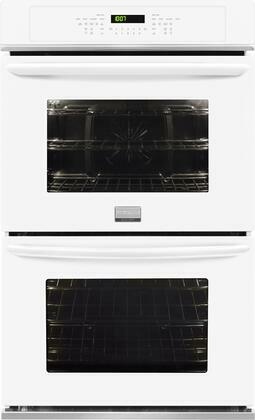 Quick preheat Preheats the ovens in less than 6 minutes, so you can quickly begin cooking multiple courses. One-touch keep-warm setting makes sure meals stay warm until they're ready to be served. Effortless temperature probe Shows you the internal temperature of food cooking in the upper oven, alerting you when a desired temperature has been reached. Auto oven shutoff Turns off the ovens after 6 hours for safe use. Control lock prevents unintentional or unsupervised activation. Chemical- and odor-free self-clean with steam-clean option Tackles cleanup for you, so you don't have to scrub. Delay-clean lets you set the ovens to start cleaning up to 4 hours in advance to suit your schedule. Extra-large oven windows With 2 halogen interior lights in each oven let you check on the progress of food without having to open the doors.